حشوات المعمول تختلف بحسب ذوق ربة المنزل وما تفضله ، فهناك من يختار المعمول بالفستق او الجوز لاكن معمول التمر هو الاكثر شهرة ، وقد يذهب البعض الى انواع اخرى من الحشوات، مثل معمول بحبنة الكيري ، في هذا الموضوع سنقدم لكم المعمول بثلاث حشوات مقدمة من فندق كونراد دبي و محضرة من قبل الشيف تامر شوقي. في وعاء صغير، اعجني التمر مع الزبدة وجوز الططيب. امزجي الجوز معه وضعيه في البراد لمدة نصف ساعة. ضعي كل طبقة ضغطّيها في قالبها الخاص وضعي العليها الحشوة حسب كل قالب كما ذكرنا مسبقاً. اضغطي على الحشوة بلطف وليس بقوة حتى لا تتشقّق العجينة ثم كوّني حبّات المعمول. يمكنك اختيار قوالب مختلفة لحشوات مختلفة، ولكن قمنا باختيار القوالب التقليدية لك لتحضّري المعمول على طريقته الأصلية. لا تقومي بوضع المعمول بالبراد بل ضعيه في علبة محكمة الإغلاق. In a small bowl, combine chopped walnuts, sugar, cinnamon and orange blossom water . Set aside. In a small bowl, combine chopped pistachio, sugar and orange blossom water . Set aside. In a bowl, knead the dates with butter, nutmeg. Mix in the walnuts and place in fridge for ½ hour. Mix the semolina, T45 Flour, Mahlab, sugar and butter together. Now slowly add the orange blossom water, kneading and working it into soft sticky dough. Cover the dough and let it sit 2 hours. Knead dough one more time and then divide the dough into three even quantities. Pinch off small lumps off the dough. Using the palm of your hand flatten the dough and make sure it is quite thin but not too thin that it will tear. Place the flatten dough into the mold of choice and add the filling associated to that mold, gently pressing down and make sure it’s quite compact. Don’t exert too much pressure as you don’t want to tear the dough. You can use the mold you like for the filling you like but traditionally these molds and their designs have been used as standards so that one can determine the filling. Dust a baking tray with semolina and bake in a preheated oven 180 C. Leave aside to cool then sprinkle with powdered sugar and serve. 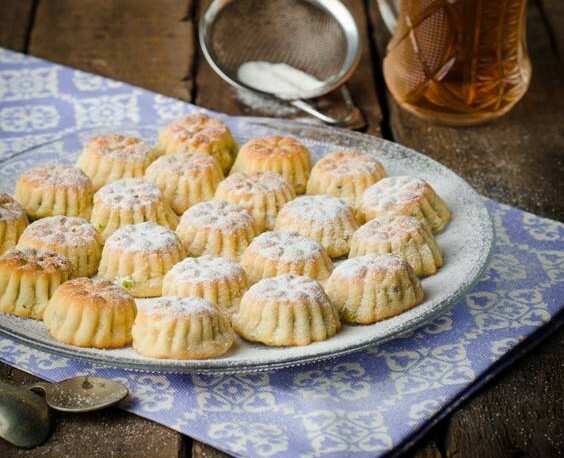 Maamoul cookies with the date filling are not sprinkled with powdered sugar. Maamoul cookies will keep, unrefrigerated but well-sealed for up to one month, if they last longer than a day.